We currently have 9 DVDs available to purchase here online. You can also order by phone or post if you prefer. Payment can be made by credit card or cheque and orders are normally despatched by post next working day. 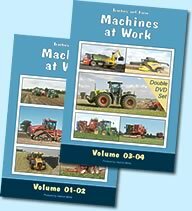 Volume 4 of our Machines at Work DVD series is now available. Charity Donations £7140 Special thanks to everyone who's purchsed our DVDs, this has enabled us to send 15 chqs to charities totalling £7140 since Sept. 2010. 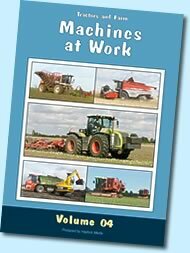 This is the first in a new series of DVDs featuring a range of Tractors and Farm Machines at work. The DVD includes operator comments and information about their machines. There are fifteen farming operations covered on the DVD - total runtime approx. 82 mins. 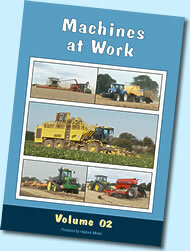 This is the second in a new series of DVDs featuring a range of Tractors and Farm Machines at work. The DVD includes operator comments and information about their machines. There are seventeen farming operations covered on the DVD - total runtime approx. 82 mins. This DVD dual pack contains Machines at Work Volume 01 and Volume 02 and offers a saving of £3 over buying the dvds packed individually and takes up less storage space. 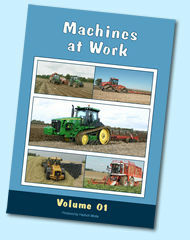 This is the 3rd in a new series of DVDs that shows farm machines at work. On this DVD we feature the impressive CR9090 combine with it’s 35ft header eating into a crop of OSR with comments from it’s operator Shaun. On the beet harvesting front we see 2 giant 6 row self propelled machines at work and their operators tell us about them. And for some really fast high speed action ‘machines at work’ we have contractors muck spreading, baling and grass foraging. Plus we have a range of ploughing, cultivating and drilling tasks, not forgetting the carrot harvesting and Steven with his MF combine and its powerflow header that excels in a laid crop. 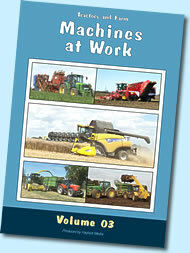 This is the 4th in our series of DVDs that shows farm machines at work. On this DVD we feature the impressive new Claas Xerion 5000 pre production model working with a Sumo Quatro. Also from Claas is the new Lexion 630 pre series combine for 2011. We see a TNS demonstration of the new MF 9280AL Delta combine harvesting OSR. A New Holland Clayson M133 combine can also be seen hard at work. And for some really fast high speed action ‘machines at work’ we have contractors muck spreading, maize foraging plus beet and pea harvesting. We also see ploughing and drilling plus hoeing brassica with the Garford Robocrop that is computer controlled. Combining with the new Claas Lexion 630 harvester for 2011. Combing OSR with new MF 9280 Delta and MF 7282 Centora plus topping stubble with Spearhead Multicut 620 rotary mower on MF 5480 tractor. Hoeing with Garford Robocrop Inrow - electronic controlled hoe. Muck spreading with the giant Holmer Variant 600 with Bergmann spreader and filling with JCB JS145LC tracked excavator loader. Harvesting maize with Claas 960 Jaguar forager plus carting and clamping. Drilling wheat with Case 335 and Pottinger Terrasem C6 6m drill. Beet harvesting with two Vervaet 617 6 row harvesters and 5 tractor-trailers. 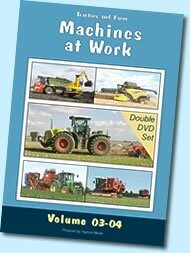 This DVD dual pack contains Machines at Work Volume 03 and Volume 04 and offers a saving of £3 over buying the dvds packed individually and takes up less storage space. You get two DVD dual packs containing Machines at Work Volumes 01 and 02 in one case and Machines at Work Volumes 03 and 04 in another case. This offers a saving of £9.00 over buying the dvds packed individually and takes up less storage space as you only have 2 cases instead of 4 to store. 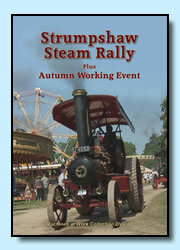 We see steam engines of all types and sizes being prepared at the start of the three day rally. There are over 50 full size steam engines ranging from traction engines, road locomotives, road rollers, showman's engines to steam powered wagons and cars at the rally. Many of these giant engines are around 100 years old and have been lovingly restored to their original glory. We watch these colourful engines make their way graciously to the main arena where we join visitors inspecting the engines close up. 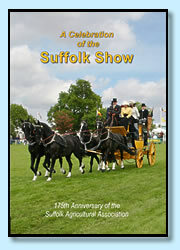 The Suffolk Agricultural Association celebrated their 175th anniversary in 2006. The first Suffolk Show was held at Woodbridge in 1831 and since those early days the Show has gone from strength to strength. Today the event held on a permanent site at Ipswich is recognised as one of the leading county shows in the UK. Archive film from 1974 to 1975 is used with old photographs going back to the late 1800s of the Norfolk village to illustrate how it had changed in the previous 100 years. There is also a short comedy film titled 'Farm Production' that was made in the village and features local residends. A Collection of 7 short films of times past in the villages of Bunwell and Carleton Rode in Norfolk. Films were made in the villages during the period 1974 to 1984. Please contact us if you wish to order for delivery outside of Europe. We donate at least £5 to Charity for each DVD sold on this website.